Published March 6, 2013 By Anna T. This post may contain affiliate links. Regardless, I only recommend sites I've researched and/or used and trust. 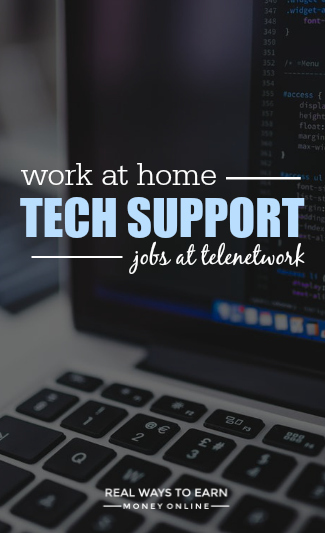 If you have previous work at home, customer service, call center, or internal helpdesk experience, you may be able to get a job doing tech support from home for teleNetwork. Currently this position is only available to people in Alabama, Arizona, Colorado, Florida, Kansas, Mississippi, Missouri, New Mexico, Nevada, North Carolina, South Carolina, Tennessee, Texas, Utah, and Wyoming. If you're not in those locations, keep tabs on this page to see if the areas change. What if you don't have tech support experience? Fortunately teleNetwork is willing to train you on the job. However, you'll have the best chance of getting hired if you know at least a little something about dealing with tech issues and have had some prior customer support experience. For instance, understanding how to deal with minor problems that come up with your internet/network at home is a good thing. You may find the job easier if you can do that. The company is described as, “the leading provider of outsourced technical support services and help desk solutions for industry leaders in telecommunications and management consulting.” The company was founded in 1993 and hires people to work both in house and from home. I've seen a few contradictory reports on pay in the forums, but the most recent ones posts have people claiming to start at $8 to $9 an hour. After 45-90 days you should be eligible for raises in $1 increments. There are also bonuses and incentives for upselling. How and when do they pay? You get paid twice a month with direct deposit. Yes, they list a bunch of awesome benefits on their careers page including health care, dental, vision, vacation, and holiday pay. You can read more details about the benefits here on their careers page. You will not qualify for benefits until after you have worked for teleNetwork for at least six months. Do you need a land line to do the job? No. teleNetwork will have you install something called a “soft phone” onto your computer. You will use this to answer the inbound calls. What other tech requirements are there? Additional software programs which may be required including Adobe Acrobat reader. And of course you'll need a quiet background to work in. You can be either full-time or part-time for teleNetwork. The hours per week range from about 20 to 36 with part-time starting at 20 hours per week. This is a pretty flexible phone job that allows you to list your availability for scheduling. You can work daytime or evening hours. Some weekend work will be required every month, but you can split it up how you need to. There are a few different steps. The first thing you do is fill out an online application from their website. You'll have to take some tests that mostly cover how well you can troubleshoot things. If you pass those, you'll have a phone interview. If that goes well, another interview via Skype will be conducted. And if THAT goes well, you will probably get offered the position. There is two weeks worth of training. This appears to be an employee position so I'm guessing the training is paid. Each week of training is about 20 to 25 hours total. After that you can start working. If you live in one of the listed states, you can go here to start your application process for teleNetwork. Good luck! Looking for more work at home opportunities? If you want to find more work at home job leads, try a subscription to FlexJobs! This is a site I've been using personally for over two years now. FlexJobs posts work at home and flexible job leads five days per week, and they guarantee them all to be legit! Also, their site organization is fantastic. They have almost every job category you can think of covered, making it super simple to find the jobs you're best suited for. You can go here to try a membership. It's $14.95 a month, but you can set your account up so you are not billed again after the first month if you're just looking to try it out and see what's there. Hello I wanted to make a quick comment on the states. I live in Missouri about an hour out of St Louis and they offered me an interview for tech support. Not sure if they added Missouri but just wanted to let you know just in case you want to find out and update a state. Thanks for the information and comments everyone! Great place to read about this company! I have worked for teleNetwork for over two years and I genuinely enjoy it. As far as raises go, you honestly do have to earn them by working hard and showing your stats, but I personally went up from $8 (the starting pay when I first came on board) to $12 in a year. As of now the starting pay is $9 and then an automatic bump to $10 after 30 days. I do agree the break system is difficult, however, I personally have never had much of a problem getting my breaks and lunches — honestly, when I realized how the break system worked, I asked my TL for split shifts to ensure a lunch at the same time every day, and once I was on a split it worked out fine for me. All in all I really like the company. Call centers are definitely stressful, and this one is no different, but it’s the nature of the beast. Customers don’t call in because they love us and want to tell us that…but the coworkers and supervisors I have worked with in my two years here make every pissy customer work it! 🙂 If anyone looking at this has the thick skin for call center support, I strongly recommend applying. The absolute worse company to work at home for. No breaks, no lunches, no raises. If you are a woman, forget working here as they discriminate against women. Forget good customer service as it isn’t rewarded. Be ready to lie and tell customers what they want to hear or don’t work at this place. It’s interesting that you say they discriminate against women. Every single person I’ve talked to in the application process so far has been female. I’ve yet to encounter a single male. They’re required by law to give you breaks and a lunch. In regards to customer service being rewarded, it seems like you’re just not familiar with how tech support generally works. Customers always hate the tech support reps and supervisors rarely pat anyone on the back. It’s the name of the game. I worked at TeleNetwork for 2 years recently. They start you out at $9. They mislead you about the pay raises. The only way you get a raise is if your call stats (call times, fix ratio) stay above their ridiculous levels. The company I handled tech support calls for for TeleNetwork offered some of THE WORST service in their areas, incompetent technicians were dispatched over and over and nothing was ever resolved. So of course customers are going to call back, this in turn affects the phone rep’s fix ratios. So because field techs couldn’t do their job or didn’t show up at all and the company was too cheap to upgrade their system I didn’t get a raise for the entire 2 years I worked there because of their incompetence. They will ALWAYS find an excuse to NOT give you a well deserved raise. They never listen to employee suggestions and complaints, though they ask for feedback frequently. Their break system is seriously flawed, only allow 2-3 people to take breaks at a time (with over 75 employees in a break queue at once), some days you just don’t get a lunch break. You never know the name of the floor manager on duty. Managers/Team Leaders avoid taking supervisor calls from pi ssed of customers, and just let the customers hang up and keep calling back. And the cost of benefits doesn’t justify when you only make $9/hr. Save yourself the trouble, apply elsewhere. As someone who has previously worked for Telenetwork, they are a great company. The part about $1 raise every 30-45 days is wrong though. You have to average your call times below 10-11 minutes a call. You also must maintain 3%-5% sales. This will qualify you for a raise. The good news is that from what I understand, everyone starts out at $9 an hour now. Just be ready to work there for 4-6 months AFTER your 90 days before getting that first raise. Still a great company to work for. This looks like a great opportunity! I will be sure to share and tell people who I think may be qualified. I’ve heard good things about this company also. It’s great that they don’t require a land line phone. They start at $10 here in Texas. Benefits after 90 days and you do get breaks and a lunch if you work over 7 hours.